A large eucalyptus tree swayed in the wind, rocking the crow’s nest. It was as if it was trying to put the Raida and Akram to sleep. Akram opened his beak wide and yawned. "This is boring," he said. "I’ve been thinking a lot about this. What do you say we go and visit cousin Iram in Amman. We haven’t been to the big city for a long time and I miss him." Raida, yawning herself, answered, "That’s a great idea. I miss him too. Let’s go first thing in the morning." Neither could stay awake any longer. The nest sat silent as the two glossy black crows fell asleep. As the morning sun rose over the horizon, both crows were already awake. Raida prepared a bag for them to take on their journey. She filled it with food, a comb for their feathers, clean socks, a blanket for each of them, and a map, incase they got lost. She tied the bag up and wrapped it around a long pole. "Here you go, Akram," she said, handing him the stick. "I suppose you want me to carry this all the way to Amman?" he asked, already knowing the answer. "You’re much stronger than I am." She tidied up the next and then said, "Are we ready?" "Let’s go," Akram nodded, picking up the stick. He tossed it over his wing and the two crows flew off, leaving the village of Azrak behind them and heading straight for Amman. It didn’t take long for the sun to heat the desert sky to scorching temperatures. After flying for a few hours, the crows were parched. "Oh look. There’s a darak down there. Why do you think they have a police station in the middle of the desert?" Raida asked. Ignoring her question, Akram said, "I don’t know, but I’m thirsty, so let’s have a drink." His throat was so dry that he was barely able to speak. 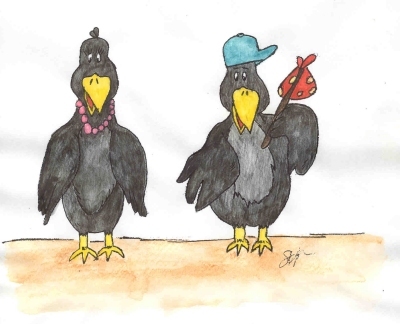 The crows landed on the burning sand next to a large boulder. Akram took the stick off his shoulder and laid the bag on the ground. He opened in and searched through it. "Where’s the water?" he asked. Hot and thirsty herself, Raida grabbed the bag and rummaged through it. There was no water. "I guess I forgot to pack it," she said, feeling rather embarrassed. "No water! We’re going to die," Akram shouted, believing it to be true. "Don’t be silly. Here, eat one of these tangerines. It’s got juice in it," she said, putting the fruit in Akram’s claw. He peeled it and squeezed all the juice into his mouth. It helped quench his thirst. "It’s not as refreshing as water," he grumbled, but at least he wasn’t going to die. Raida did the same with her fruit. That day, as they flew towards Amman, they had to stop several times to eat another tangerine. As the sun began to set and the desert started to cool down, Raida asked, "Where are we going to sleep tonight?" Akram scanned the horizon from above. Off in the distance he saw a building. "Look over there," he pointed. Raida saw it too. As they got closer, they saw that it was some kind of castle in ruins. Landing on the edge of one of the walls, the crows looked down into the courtyard. "There’s a sign down there that says ‘Qasr Haraneh’. Did you know that Qasr means the same as castle?" Raida looked around. "It looks abandoned, but safe." Akram flew to the ground and stood inside the courtyard. All he could see were a lot of empty rooms, cold stone steps, and broken pieces of the building lying on the ground. They could perch on them or stay in one of the rooms and hopefully get a good night sleep. He flew up to the second floor and went into a large, but dark room. It looked safe and comfortable. "Come on, Raida. This looks good," he called to her. By now it was pitch black outside except for the crescent moon and twinkling stars. "It’s very quiet in here," Raida said, helping Akram take the stick and bag off his wing. They ate some tabouli, falafel, and figs for supper, grabbed their blankets and tried to go to sleep. It didn’t take long for the exhausted Raida to nod off. Akram however, had a more difficult time. He lay with his eyes wide open, enjoying the cool of the night. A breeze brushed across his feathers. His eyes shut and he snuggled up when suddenly he heard a noise. CLANK! THUD! He jumped up. "What was that?" CLANK! THUD! He shivered and shook with fear. Shaking Raida, he whispered, "Raida, wake up. There’s something out there." "What is it?" the sleepy crow asked. "There’s a ghost out there," Akram sighed. Raida sat up and listened. She couldn’t hear a thing. "You’re just imagining things. Go back to sleep," she said and lay back down, pulling the blanket over her head. Akram lay back down, but soon her heard sounds. CLANK! THUD! He shook Raida again. "Wake up. There’s that noise again." This time Raida was wide awake and feeling angry with Akram. "What is it this time? There is no noiose. Oh, I might as well go and see what it is or I’ll never get any sleep." She got up and walked over to the edge of the room, gazing down into the courtyard. "There’s nothing there, Akram. Whatever you heard is gone. Now, forget it and go to sleep!" "But Raida, I did hear a noise. Won’t you go down and see what it is?" he pleaded. Raida looked at the terrified crow and shook her head. She knew there would be no peace until she went down into the courtyard. Flying around the qasr, she peeked in several of the dark rooms. "I found it, Akram! It’s a loose piece of wood. It’s banging against the wall." She pulled the wood down and tossed it on the floor. "You’re such a scaredy cat," she snarled, and lay down next to Akram. "I’m not scared. I just didn’t want anything to happen to you," Akram lied. Feeling safer, he lay back down. Both birds were asleep in minutes. Akram snored. A cool breeze blew across the courtyard, up the stone steps, and into the room where the crows slept. It flowed around the room and then ruffled Akram’s feathers. He sat up, wondering what had just woken him up. The wind blew across his back. He jumped up. The wind swirled around him making an eerie sound. Akram was terrified. "Wake up, Raida. Something weird is happening." Raida opened her eyes and looked at Akram. "What is it now?" she asked. "There’s a strange wind blowing on me and it makes weird noises," he answered. Raida pulled her blanket back, stood up impatiently, and walked around the room. She couldn’t feel any wind. "Oh come on now, Akram. It was just a desert breeze. Go to sleep." She lay down and shut her eyes. Akram noticed the wind had stopped so he lay down. While he was fluffing up his blanket, the wind gushed around him again. He walked over to the edge of the room and gazed all around the castle. The wind wasn’t coming from the courtyard, or from the outside. It was coming up the steps. He stood at the top of the steps and the wind nearly knocked him over. "There must be a window open or a door blown off its hinges," he convinced himself and went to sleep. "OOOOOOOOOOOOOOOOOOOOOO!" A loud noise penetrated the silence of the desert night. Both Akram and Raida woke up with a fright. "What was that?" Raida asked. "Maybe the wind?" Akram said, unsurely. "that was no wind. It sound like a…" she began. "A ghost? Is there a ghost in here?" Akram asked, terrified to hear the answer. "Oh no!" he shivered. He ran over to his blanket and pulled it across his beak and wings. Raida crawled over the edge of the room and peeked over. There, in the courtyard, was a ghost. It was white and was floating through the air. Shaking with fear, Raida crawled over to Akram. She pulled him by his wing and they two of them made their way over to the corner of the room where it was very dark. "It is a ghost," she whispered. "Be very quiet and maybe it won’t find us." She wrapped her wings around Akram, pulled his blanket over them and they huddled in the corner, shaking, until the sun came up. In the safety of daylight, they gathered up their belongings, put them in the bag and tied the bag to the stick. Raida crawled back over to the edge very slowly, to see if the ghost was still there. To her surprise she saw a piece of white fabric bunched up in the corner. It was caught on a large rock. She felt very foolish. "Akram, come and see this. There was no ghost last night. It was only a piece of cloth. Our imaginations got the best of us." Akram saw it too. "Whew, I’m glad it wasn’t a ghost. But what went ‘OOOOOO’?" He looked at the cloth. "Oh well, let’s just leave here. This old qasr gives me the creeps." He picked up the stick with the bag, tossed it over his wing and they flew towards Amman. "Let’s not mention this to Iram," Raida suggested. "Don’t worry. I want to forget about last night. It never happened," Akram agreed. As they flew towards the rising sun, the ghost of Desert Qasr Haraneh floated up to the collapsed roof and watched as the crows flew away. He held up his chains and rattled them. CLANK! THUD! He let out a screech. "OOOOOOOOOOOOO!" A strong wind blew all around him and he laughed out loud. Akram turned and looked back at the castle standing alone in the middle of the desert. He could have sworn he’d just heard a ghost howl, but knew it must be his imagination. He turned back around and flew on through the clouds with Raida.